Reacting to the reports about the blaze engulfing the Notre Dame, French President Emmanuel Macron said that the 'terrible fire' forced him to cancel a planned address to the nation that was set to take place on Monday evening. "We are all going through a moment of extreme sadness. The 'Renaissance' list is understandably part of this moment of national unity. 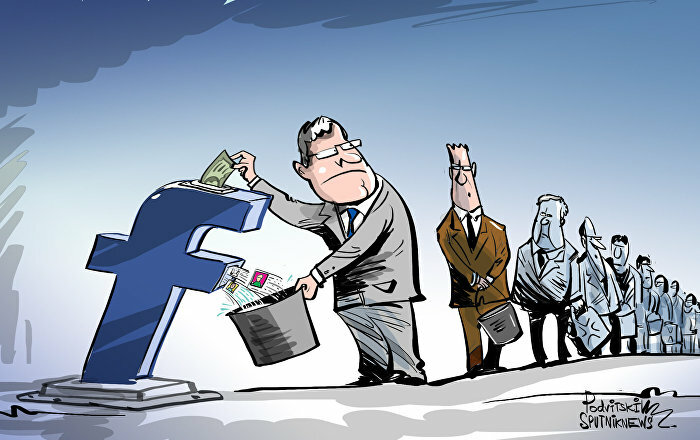 We are therefore suspending the campaign until further notice," French politician Nathalie Loiseau wrote on her Twitter account. According to BFM, they would be tranferred to the Louvre on Tuesday or Wednesday. "The fire is under control but not totally extinguished," French junior interior minister Laurent Nunez said. A massive blaze that gripped the landmark Notre Dame cathedral in Paris has been extinguished, Lieut. Col. Gabriel Plus, a spokesperson for the Paris fire brigade, said. "The fire has been extinguished. We will continue ... cooling hot parts [of the building], including the frame, to make sure that the fire does not resume," Plus told Reuters. Massive fire that damaged the landmark Notre Dame cathedral in Paris is now under control, the Parisien newspaper reported. A massive blaze broke out at the 850-year-old church on Monday, destroying its spire. French President Emmanuel Macron praised firefighters for sparing the cathedral's iconic facade and towers from being destroyed. Macron arrived at the site of the blaze for the second time. French president said that the upcoming hours of extinguishing the blaze are going to be very difficult but the main structure of the building was saved. "What has happened today is obviously a terrible drama. First of all I would like to thank Paris firefighters. Almost 400 people have been battling the fire for several hours and continue doing it," Macron, who arrived at the fire site for the second time during the evening, said. His speech was aired by the BFMTV broadcaster. "Notre Dame is our history, our literature, our imagination, where we lived all our great moments ... It is the epicenter of our lives," he underlined. 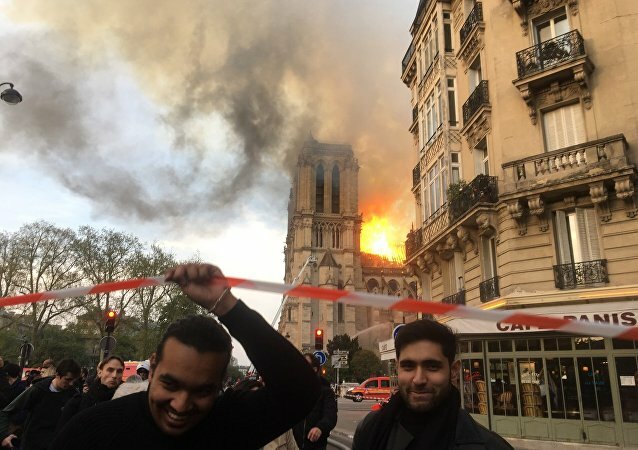 He stressed the firefighters had demonstrated great courage and professionalism by sparing Notre Dame’s facade and two towers from being destroyed. "The worst has been avoided. But the battle has not been totally won yet. The next few hours will be difficult," Macron stressed, expressing support for the French and world Catholics on the Holy Week leading to Easter Sunday. He pledged that the historic Gothic cathedral would be rebuilt, calling on the world’s “greatest talents” to help. Treasure of iconic Notre Dame cathedral are unlikely affected by the Monday fire that swept the building, as its holy relics are kept in a sacristy, a spokesman for the cathedral, Andre Fino, said. The fire, which started earlier in the day, has already destroyed the cathedral's spire. "We need to see the storage that protects the cathedral, whether it is affected or not ... 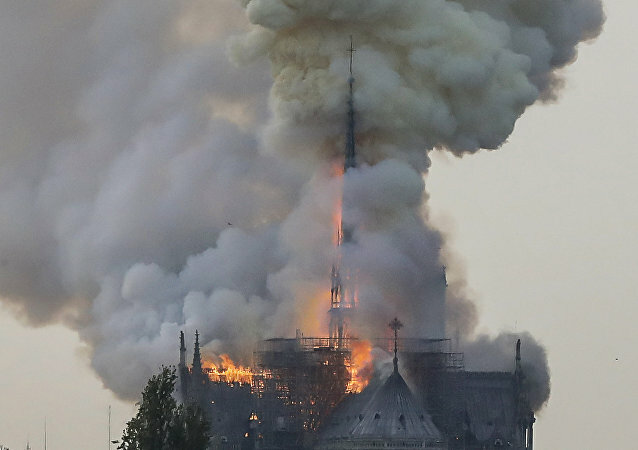 The holy relics are stored in a sacristy, usually there is no risk that it can be caught on fire," Fino said, as quoted by Le Figaro newspaper. Gisotti expressed the Vatican’s solidarity with Catholics in France and the people of Paris, adding they prayed for firefighters and other first responders dealing with this dramatic situation. Firefighters are examining the interior of the right tower of the iconic Notre Dame Cathedral in Paris, which erupted in flames earlier in the day, a Sputnik correspondent reported from the site. Firefighters are examining the tower from the inside using flashlights, according to the correspondent. Earlier in the day, a Sputnik correspondent reported from the scene that the left bell tower of the cathedral had also gone up in flames. The cathedral's roof and spire have already collapsed. The left bell tower of the iconic Notre Dame Cathedral in Paris has gone up in flames, a Sputnik correspondent reported from the scene. 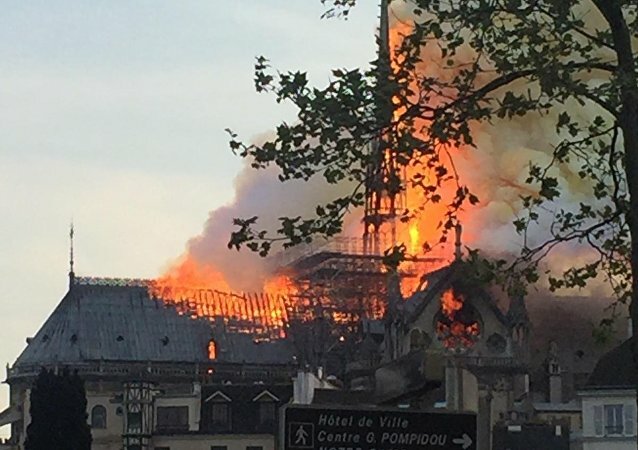 The Gothic cathedral's roof and spire have already collapsed. The flames are spreading rapidly through the building as some 400 firefighters were dispatched to contain the blaze.